FInding a useful app on the Windows Store was sort of like finding water in the desert. It happens, sure, but not nearly often enough. But Microsoft is on a mission to get 1 billion Windows devices in the hands of consumers, and in order to saturate that desert, it's going to need a lot more water. At the Build 2015 keynote this morning EVP of the Operating Systems Group Terry Myerson revealed the answer. "The third technology I'm announcing today is that Windows Studio will let developers reuse all the Java and C++ code from an Android app to a phone app running Windows 10," Myerson said right before announcing that re-tooled Xcode projects - the kind used to create iOS apps - will also work on Windows 10. Stop and think about that for a second. Every app that's ever been made for Android and iOS could now come to Windows 10 with a few clicks. That's huge. To put it in perspective, the Windows Phone Store has around 300,000 apps at the moment. That's a drop in the bucket compared to the 1.3 million apps on Android's Google Play store and 1.2 million apps on the iOS App Store. 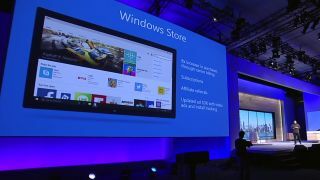 According to Myerson, these apps would then be able to take advantage of every product on the Windows Platform - including the Microsoft Surface tablet, Lumia Phones, Xbox One, Windows 10 PCs and laptops, and the upcoming Microsoft HoloLens. When it comes to apps, Windows 10 is about to get a seriously huge boost.